With the year almost coming to a close already, ASUS Philippines could not have found a better time to once again add another feather in its cap. After making waves in the entire country with the still much talked-about and successful launch of the ZenFone 2 series last August, ASUS Philippines once again took things by storm, but this time on a global scale. Just recently, ASUS Philippines got the lion’s share of prizes from the “100 Days of Zen” photography contest – arguably, one of the biggest campaigns launched by ASUS Global this 2015 – wherein an unprecedented turnout of 70% of the contest’s winners came from the Philippines. Owing this remarkable feat to the Filipino public’s overwhelming support for the brand, ASUS Philippines decided to make this milestone even more incredible, by putting together a special event that would ultimately pick up from the success of the “100 Days of Zen” campaign, and take it up even a notch higher. Aptly called #OneDayofZen, this special affair would likewise make use of the ZenFone 2 Laser 5.0 as its centerpiece, leveraging on the local market’s continuously growing fervor and fascination over this smartphone. While the “100 Days of Zen” showcased the superior photo quality of the ZenFone 2, the #OneDayofZen event intended to teach the public how to actually take such powerful photos using the ZenFone 2 Laser 5.0. With this, ASUS Philippines kicked-off the event in high gear, via a back-to-back smartphone photography workshop led by none other than two of the country’s most in-demand photographers in Jay Tablante and Roy Macam. Widely known for their works in fashion, beauty and pop culture, both lensmen openly lent their expertise, shared pro tips and tricks, and also touched on the evolution of mobile photography. From there, they then gave helpful points on how one can maximize the features and capabilities of the ZenFone 2 Laser 5.0, taking the audience through various scenarios and conditions they might face when taking any and all kinds of photos. It was during these workshops that it was proven that it was not just the ordinary gadget lovers or tech-savvy individuals who were the only ones who caught the ZenFone 2 series fever during its launch this year. In fact, Jay and Roy, both celebrated photographers with wide-spread careers, shared their awe on ZenFone 2’s photo prowess. Right after the workshops, all 100 of the invited guests then made their way to the historical site of Fort Santiago, where a one-of-a-kind outdoor photography challenge awaited them. The photo categories, which included Best Selfie, Best Indoor Shot, and Best Outdoor Shot, were chosen to showcase the ZenFone 2 Laser 5.0’s unique selling points, and unparalleled photography quality and capabilities. ASUS Philippines also let netizens in on the fun and celebration of #OneDayofZen through a special offer for the followers of any of the 100 attendees. Interested participants must submit a clear, scanned copy of their official receipt of any recent ZenFone 2 purchase made in the Philippines from November 21 – 30, 2015, along with their favorite photo uploaded by any of the attendees for #OneDayofZen. The first 25 individuals to send both these requirements to marketing@asusph.com, will get to win a limited edition Zenny Doll. “For this particular milestone for ASUS Philippines, we wanted to really pull out all the stops to celebrate with some of those who have continuously given us their support. We wanted to think of a different way to give back to them, while at the same time showcasing the ZenFone 2 Laser 5.0’s features and capabilities, and that is just how #OneDayofZen came about. We were very happy to see everyone having fun with their ZenFone 2 Laser 5.0 units during the outdoor photography challenge in Fort Santiago, and everyone also had a blast with the two celebrated photographers who joined us in the morning. 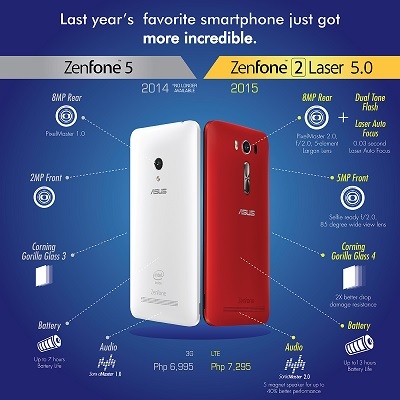 On that note, I invite everyone to quickly get a ZenFone 2 Laser 5.0 for themselves right away, if they too want to experience the best smartphone photography quality available out there,” closes ASUS Philippines PR and Events Specialist Francis Garcia.